Heat oven to 350°F. Line cookie sheet with cooking parchment paper or baking mat. Unroll 1 can (8 oz) Pillsbury™ refrigerated crescent dough sheet on cookie sheet. Using hands, spread dough evenly. 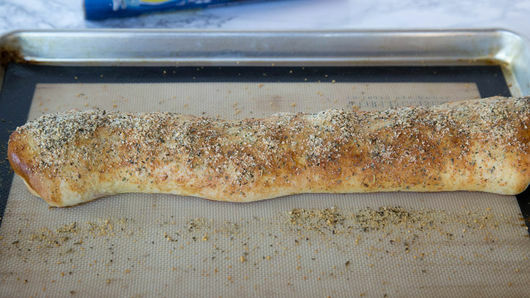 Sprinkle 1 cup shredded mozzarella cheese (4 oz) over dough, leaving 1/2-inch border around edges. 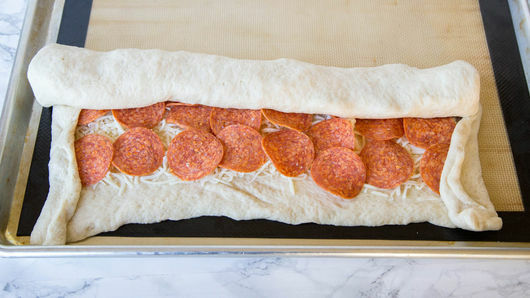 Place 40 slices pepperoni in rows over cheese. Fold short end of dough just over edge of pepperoni. Starting at the long end, roll dough, pinching to seal. Place seam side down on cookie sheet. Mix 1 egg with 1 tablespoon water. 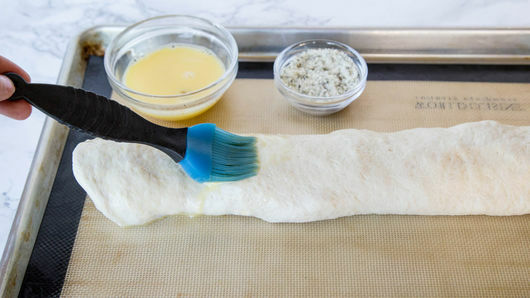 Brush egg mixture over dough (you will have egg leftover). Mix 1 tablespoon grated Parmesan cheese and 3/4 teaspoon Italian seasoning. 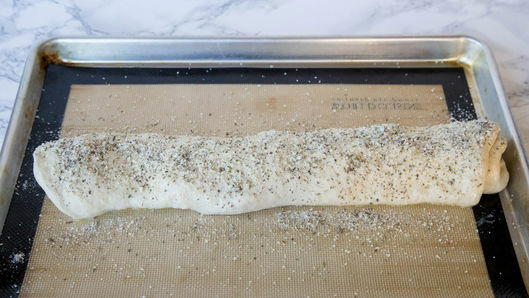 Sprinkle evenly over dough. Bake 14 to 18 minutes or until golden brown. Cut into 2-inch pieces; serve with pizza sauce or marinara sauce for dipping. 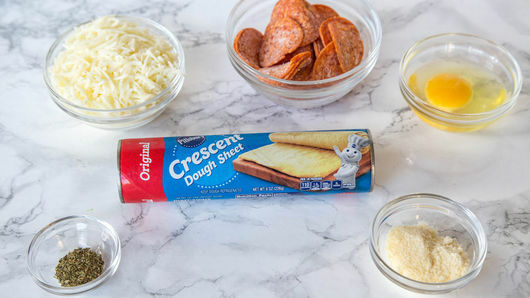 1 can (11 oz) Pillsbury™ refrigerated thin pizza crust works great in place of the crescent dough sheet in this recipe. Use green peppers, mushrooms or ripe olives to make a vegetarian version. 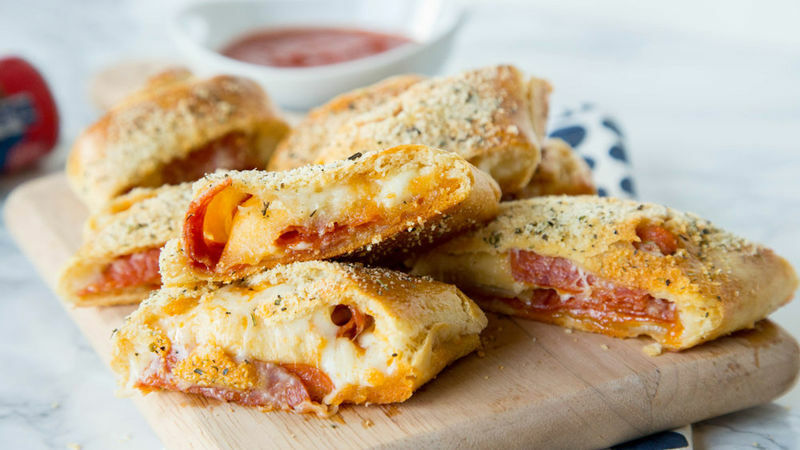 When you first saw this pepperoni pizza bread recipe, you might have noticed that there’s no sauce inside of it. And you might have been alarmed. “Pizza needs sauce! You’ve already turned my favorite food inside out, and yes, the results look delicious and are baked to cheesy, meaty perfection, but no sauce?! That’s craziness,” you might have said. And you’d have been right. 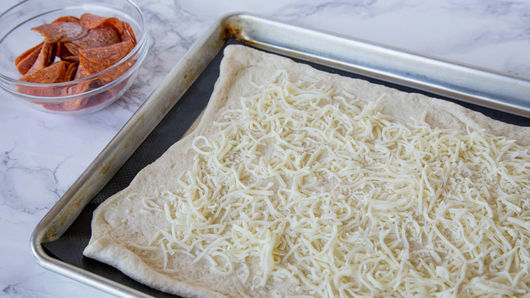 So whether you have a big serving of this pizza bread for dinner, or slice it up small for a shareable app, we insist that when you make yours, you serve it with a bowl of marinara sauce for dipping. After all, anything else would be craziness.